Catherine Hammon, Digital Revolution Knowledge Lawyer at Osborne Clarke, has experienced first-hand how technology has improved lawyers’ lives. Indeed, aspiring lawyers of today will never take part in six-week Post-It note binges. Firms have long been using online document review, where lawyers can tag important information electronically. Now, eyes have turned to more efficient systems which, utilising artificial intelligence (AI), can be “trained” to recognise content to a level of accuracy equal to, or better than, humans. Digital transformation is Hammon’s bread and butter. 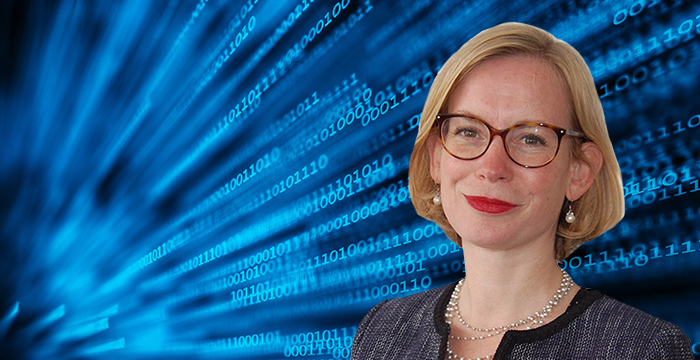 After spending more than 20 years as a specialist in EU and UK competition and merger control law, less than a year ago she ditched her “comfort blanket of detail and deep specialism” to move into a “big picture role” at Osborne Clarke. This proved “incredibly invigorating” for Hammon: “Osborne Clarke is the kind of firm that is open to these kinds of things. It’s a place of opportunities,” she says. Hammon’s job is to “join up the dots” and look at the big picture to understand how technological disruption is changing the world. Hammon runs firm-wide technical training programmes on the likes of: AI, blockchain and cryptocurrencies, and the Internet of Things and also keeps a close eye on virtual reality, 3D and 4D printing, drones and quantum computing. Blockchain is a big issue for the firm and its financial services clients (amongst others). It throws up interesting legal issues, for example: because blockchain technology is not overseen by a central authority, it sits above geographical jurisdictions. So, if a blockchain dispute arises, which court should hear it? Which law should apply? These are the questions lawyers are currently grappling with. Osborne Clarke recently produced a helpful report on some of these themes. The best thing law students and aspiring lawyers can do now is familiarise themselves with key concepts and ideas. There are a “huge number of tech sources” out there that can help you do this, including: Wired, TechCrunch and Computer Weekly — Legal Cheek covers key developments in technology and the law, too. Hammon believes the current position on technology can be summed up by a quote from Microsoft founder Bill Gates: “Most people overestimate what they can do in two years and underestimate what they can do in ten years.” Rest assured, though, that technology, particularly AI systems, will be changing the way lawyers work and what lawyers do in the near(ish) future. But how? For starters, “automated systems like document review don’t initially work on their own. They need humans who understand the issues and can train the system to recognise the types of document (or even phrases) being looked for, to a high level of accuracy”. This means front-loading the lawyers at the beginning of the document review process, to train up the tech. Once that’s done, the lawyers stand back to let it get to work, and then step back in at the end to analyse what the tech has found and feed it into strategy — something which the tech tool can’t do. As well, technology has opened up entirely new jobs for its aficionados: “No one’s granny was a search engine optimisation expert”, Hammon says — nor were they a digital revolution knowledge lawyer. There will be more and different types of roles for legal professionals going forwards. Future-focused candidates who are interested in training at Osborne Clarke can find out more about the firm on its graduate recruitment website. About Legal Cheek Careers posts. Lawyers being replaced by technology, should we be scared?